Answer is in “alternative title"
1) Correlate the morphology of red blood cells with their functions. In particular, how is it suited for circulation through tight spaces (capillaries) or exchange of gases. 2) Anemias can be classified on the basis of cell size shape, stainability and inherited disorders in hemoglobin synthesis. Identify some of the types of anemias. 3) In blood replacement, why is cross-matching for blood type so important? What happens if the wrong type is given? 4) What do the secretory granules in a platelet contain? How does the platelet maintain its shape? What causes them to become sticky? 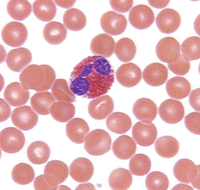 5) How would you distinguish a monocyte and a small lymphocyte? 6) How do neutrophils serve as first line of defense against bacterial invasion? 7) How do eosinophils serve in the control of parasites? How do they serve during allergic reactions? 8) How do basophils function during an allergic response? 9) What is the difference between blood plasma and serum? 10) What are colony forming unit cells? How were they discovered? If you wanted to save mice after a lethal dose of irradiation, how many CFU cells would be needed? 11) Which CFU cell gives rise to erythrocytes? Give a general description of the different steps in the process. 12) Why are physicians encouraged if they see reticulocytes in the blood of patients being treated for anemia? 13) What is the origin of the monocyte?